The 2012 Positive Parental Participation Challenge is underway! Picture books and kids go together like peanut butter and jelly. Reading with your child only takes a little time each day, but the impact it will have on your child is big and will last a life-time. I’ve just linked up with a fantastic resource for parents and teachers and anyone who wants to find great picture books to read with young children. What’s really cool is that for many of the stories, there are also suggestions for other activities that extend the learning experience. Perfect Picture Book Friday is part of the blog of Susannah Leonard Hill, a talented author of many children’s books. I’m honored to contribute, and hope that her site will also encourage every parent and anyone involved in the care and education of young children to take part in the 2012 Positive Parental Participation Challenge. Here’s a wonderful picture book that I have shared with hundreds of children. As the author says, “This is a story for any child who confronts a difficult situation, and for the child within each of us who sometimes needs reassurance.” The Kissing Hand will help any child who is anxious about starting a new school or trying a new experience. The little raccoon would rather stay home with his mother and play with his friends and swing on his swings because he is afraid of the new experience of going to school. Chester’s mother is able to help her son overcome his fears by giving him a special secret that her mother shared with her when she was little. Young children love this story and appreciate Chester’s fear because many of them have experienced it also. As adults, we might envy the carefree life of a child…with no responsibilities and all the time in the world to play. However, a child’s life is not really carefree…and children are learning at an amazing rate while they are playing…and especially while they are sharing a story with a parent! Young children can identify with Chester and will be encouraged when they see how he was able to overcome his fear of going to school and his reluctance to leave all that is familiar. The book provides a wonderful opportunity for parents to engage with their children about this very common problem. If you are looking to extend the learning experience with your child, here is a super simple craft project you can do. 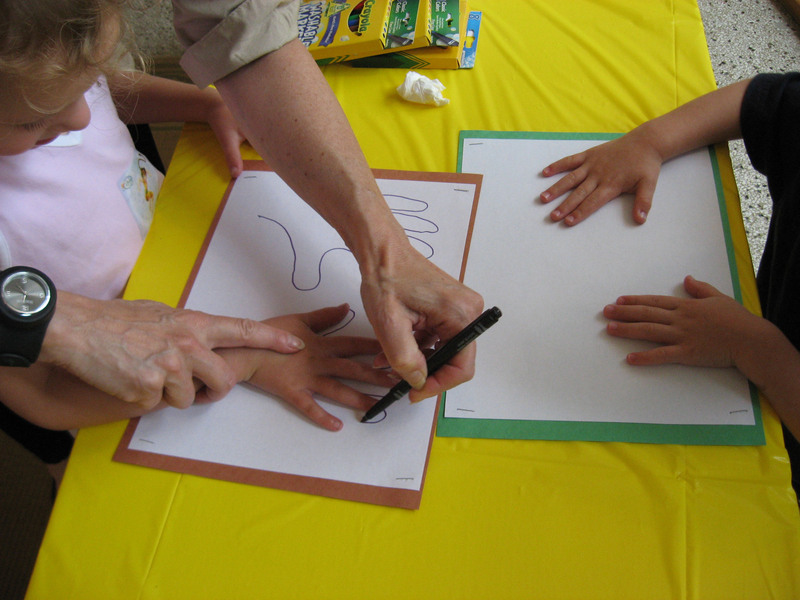 Materials needed for each child: 1 piece of light colored construction or copy paper, fine-line markers and/or crayons. Have the children place their hands on the paper. Draw the outline of their handprints. Talk to your children about the people (or pets) they love and those who love them. Let the children decide which people will be represented by each finger…mother, father, siblings, grandparents, pets, favorite stuffed animal, teacher, etc. Use markers or crayons to add the features to each finger. Make sure the children reserve one of the finger of the handprint for themselves…we need to love ourselves before we can reach out and truly love others. Help the children label each figure with a name to identify who it is. When we brought the Show-Me-How-Story-Time-With-Miss-Vivian program to Chicago last summer, we had a ball with the children who came to hear The Kissing Hand and do the KISSING HAND CRAFT with us. Reading and crafting with kids is so much fun for everyone involved! Join the 2012 Positive Parental Participation Challenge and read a story a day with your child. Leave a comment and share with us what books you are enjoying with your child. Someone is going to win a picture book at the end of each month…maybe it will be YOU! Please remember that if you participate in this Challenge, you are entitled to a $5 discount on Show Me How, a great resource that gives you 100 picture book summaries and an easy craft and simple cooking activity for each. Right now you can save two ways, because we are offering FREE SHIPPING for the month of January. 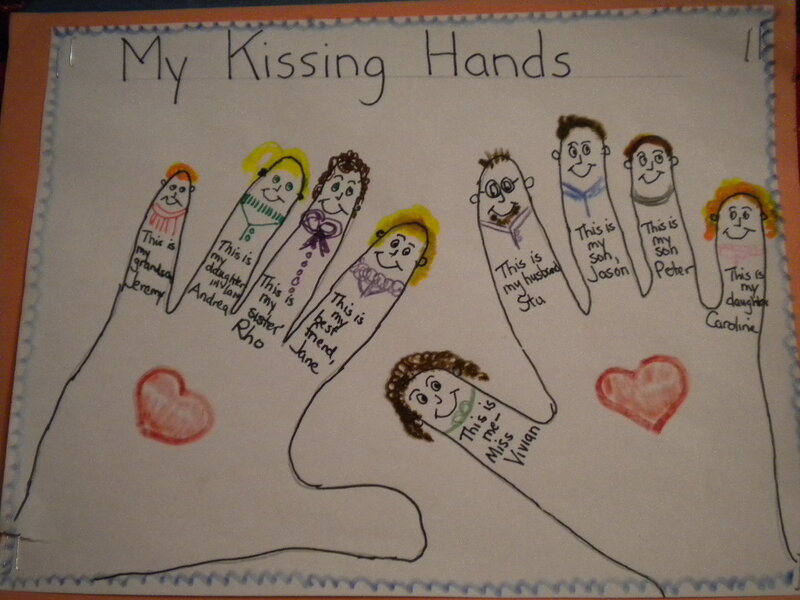 This entry was posted in children's picture books, Crafting with Children and tagged 2012 Positive Parental Participation Challenge, 365 Project, Kissing Hand, Picture book by viviankirkfield. Bookmark the permalink. Yesterday (1/5) – we read “The Teddy Bear Picnic”, “Goodnight Moon”, “Thank You Prayer”, and “Bedtime for Gus”. We didn’t do any corresponding crafts — but loved the snuggle time that we had!! WOW! That is awesome, Jenn. I went to your blog…love all of the activities…but especially love the organization you’ve been able to put into place…I need a lesson from you, I think. 🙂 Thanks for being part of the 2012 Positive Parental Pariticipation Challenge. I hope lots of other parents will hop on board! I think I will try to make a list of the books (and activities if any) that people comment on…I’ll have to figure out how to do that in an easy-to-access way. 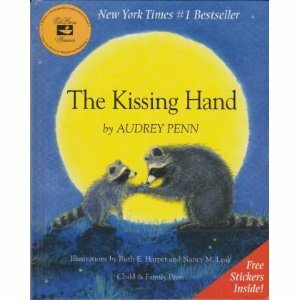 The Kissing Hand is one of our family favorites. I’m going to try the crafts this weekend. Thanks for joining in on the Challenge. Vivian, thanks so much for this wonderful PPB post and welcome to the group and the fun! As I mentioned in my email, I LOVE this book and had planned to post it in 2 weeks, but you’ve beat me to it. And I’m glad you did because I love this activity! If you haven’t added you link to my blog list yet, please do so that everyone will get over here to see this! I’m thrilled to be part of Perfect Picture Book Friday…it’s so interesting that I had decided to do the 2012 PPP Challenge to encourage parents to read picture books on a daily basis and offer a picture book at the end of each month as a prize…and then I discovered you/you discovered me. Thank you so much for the advice about your badge…I was able to figure it out with your suggestion. Also, you already linked me up with the PPBF…didn’t see The Kissing Hand on the archived list…but maybe it takes you a few days to do that. 🙂 In the future, I’ll link up myself…I’m sure you have enough to do. I’m really excited about our connection…blogging certainly helps us meet awesome people! Vivian, I didn’t know this book and find it delightful. What a super craft activity too, which all kids would love. It sounds like this book would soothe a worried adult heart too! Thank you, Joanna. I went to your blog…WOW! And your selection is one I will have to use in my school and library programs…I’m always looking for picture books with special messages that help young ones deal with the challenges they encounter in their early years. And I love the art element that is present on every page…I’m all about combining reading with arts and crafts and other activities to extend the learning experience and give parents a greater opportunity to spend time with their children and talk and listen. Vivian, I’m another PPB poster and just had to come over. I haven’t read this book yet, but I’ve been eyeing it for ages! It looks so sweet, and I adore your craft activities! Thanks for the great review — will definitely get this book now. Nice to meet you, Renee. Thanks for coming over from Susannah’s PPBF. I’m so happy to be connected with that…it’s an amazing resource for parents and teachers and, since I’m passionate about picture books, I’m thrilled to be participating. The Kissing Hand is definitely a very special book…one that definitely belongs on every child’s bookshelf. This book sounds wonderful — and I love your “hands-on” craft suggestion. Welcome to Perfect Picture Book Fridays! Glad to meet you…thanks for stopping by to read about The Kissing Hand. It’s one of my favorites…and is a favorite with every class and child who hears it. I’m hoping that my 2012 Positive Parental Participation Challenge will encourage parents to read to their children every day and I’m thrilled to link up with Susannah’s PPBF which is an awesome resource for parents and teachers. Vivian, welcome to the group. What a wonderful addition to our list. Some great lessons for kids. And, I especially loved the activities you shared. They really looked fun and supported your story. Great pick! I’m all about combining simple eco-friendly crafts and easy healthful cooking activities with beautiful classic picture books to build self-esteem and improve literacy skills. I taught kindergarten for many years…then practiced on my own three children and ran a home daycare. 🙂 So, I have LOTS of activities whirling around in my head. I feel fortunate to have connected with Susannah…and I’m really happy to meet you! I’m thrilled to be part of Susannah’s PPBF. Thanks for stopping by…I’ll come and visit you also. A fun book and craft. Thanks for stopping by, Stacy. Yes, I think this book deserves a place on every child’s bookshelf. It’s definitely a winner. The author writes in the preface that she read the book to school groups before it was ever published…and it became wildly popular. Maybe I should use my Balloon Man story with the District 11 Kindergartens as one of the four picture books I have to submit for the Show Me How Story-time Spring flyer they will send out to the teachers. What do you think? An interesting title, had to come and have a look. Thanks for sharing and loved the craft idea, nice to meet another memeber of PPF. After looking around your blog, can I ask that you check out my blog around the begining of February, as I will be having a guest appearance you may be interested in. Thank you for coming by and checking out The Kissing Hand. It is a beautiful story and I appreciate the kind words about the craft. I went to your blog and I’ve already signed up to receive your posts…so I guess I will have to be on pins and needles until February to find out who your guest will be. Love your mission to put books into the hands of kids that don’t have any! I’m hoping to encourage parents to spend time with their kids…but through the Challenge, I’m getting to meet lots of new people…so it’s going to be fun me as well! Thanks for the support, Eliz! I will have to look for this book. The project afterwards is a great idea. Thanks for sharing. Thanks for stopping by, Russ. I hopped over to your blog, so I know I don’t have to tell you that kids love arts and crafts…and every opportunity we give them to use different mediums allows them to express their creativity..and their emotions. 🙂 BTW, love your “about you” profile! I smiled all the way through it. I really like this book! 🙂 I read this (I think) in 2nd grade. I really like the art project! I’ll try it! Love this: “Reading with your child only takes a little time each day, but the impact it will have on your child is big and will last a life-time.” So true! I recognize the book but I have never read it. Love the craft you came up with! Eric…so happy you stopped by. Thank you for the kind words. The 15 minutes is such a small investment…but the rewards are enormous. It’s my mission to spread that message! Yes, this story is a favorite at the kindergarten story programs I do. And they LOVE the Kissing Hand craft…so empowering and validating for them to think of all the people who love them…and who they love. My daughter just read this book for her kindergarten class. It’s such an inspiring read for young readers, and the craft projects you’ve included are a great addition to the story as well. I’m really enjoying connecting with other kidlit bloggers through the Comment Challenge. I used this book when I taught pre-school (and with my own kids, of course) and it was always a favorite. The craft project sounds like so much fun! Thanks for stopping by, Tara. It is a wonderful book…and I’m glad you like the craft project. I just visited your blog and left a comment…loved your story about the treat-less school celebration. What a great craft project! I am always looking for new crafts to use in my library. I’m definitely keeping this one in mind – it’s so cute! And perfect for Valentine’s Day. I’m so thrilled with Susannah’s PPBF…I think it is an enormous resource for parents and teachers! What a wonderful post Vivian: great book, family favorite; terrific craft ideas and deserving nod to our PPBF leader! So sorry to have missed you at the Fall conference. Stacy tells me we would have got on well – so I look forward to the day we finally meet! Then I shall look forward to next year Vivian!